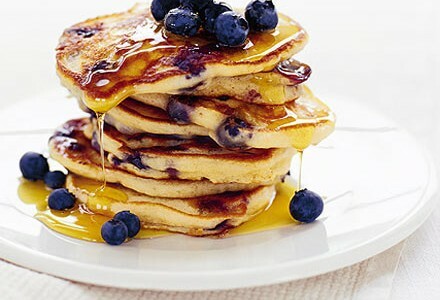 There’s nothing better than pancakes on a Sunday morning and somehow they taste even better when they’re HEALTHY! I stumbled on this recipe several years ago from a creative blogger turned author Brokeass Gourmet. They are healthy but they are absolutely fluffy, tangy, with a touch of sweetness. Combine cottage cheese, eggs, vanilla, and honey together in a blender or food processor and puree until creamy. Add the oats, cinnamon, baking powder and salt and puree until mixture is smooth and resembles slightly grainy pancake batter. Heat a very light coating of oil or spray in a nonstick frying pan or griddle over medium-high heat and cook 1/4 cup of the batter until golden brown on one side (about 1 1/2 – 2 minutes). Flip, using a spatula and cook until the other side is golden brown. Repeat until all pancakes are cooked. Serve, warm, with fruit, honey, a touch of butter, preserves and/or syrup. Makes about 5 pancakes (serves 2-3).